Every news application is trying to find the ideal way to deliver the latest happenings to you. Whether it is on your mobile phone, your computer or somehow magically injected directly into your brain, they all want to give you the latest information. The folks behind Snackr have a genius idea for bringing you the latest news. With all the hype around Siri, they realized that iPhone owners seem to like having their phone speak to them. So why not develop a newsreader that literally reads you the news? That is exactly what Snackr is designed to do. It makes finding out what is going on in the world quick and easy because it saves you the effort of reading. 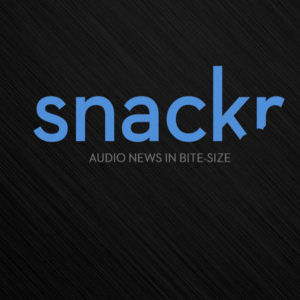 You can press play and let Snackr tell you the latest news while you drive to work, commute on the train or when you are just feeling too lazy to actually read the articles yourself. Whatever your reason for not wanting to read, Snackr is happy to oblige and do the reading for you. Best of all, it is a free application that is available now in the iTunes app store. You will need to head over to the iTunes App Store and download the application before you can do anything. When you open the application for the first time, it will ask you to log in with Facebook. This is required because the application uses Facebook to find your interests and to remind you of your friends upcoming birthdays. Grant the application the required permissions and you will be ready to start hearing the latest news delivered right to your iPhone. When you first open Snackr, it will give a brief explanation of how it works. Then, it will jump right into your personalized “5 minute snack”. This will start with a friendly greeting from Alfred, the robot who runs the show. It will then jump into your friends Facebook birthdays, local weather and then the news channels it thinks you will enjoy the most. You can swipe the screen all the way to the right to customize the channels the application reads. You can do this for your “5 minute snack” and any other set of channels. You can only use the feeds already loaded into the application. There is a decent amount of feeds from a wide range of categories. You can delete a feed from one of the sections by click the “X” or add a new feed by clicking the “+” sign. It is worth taking a minute to customize your “5 minute snack” because it is a great way to start your day and find out exactly what is going on. Besides the personalize snack, you can also add custom channels that cover a wide range of topics. It starts with some default ones, which you can delete if you are not interested in the topic. If you scroll the channel bar at the top all the way to the right, you can click “New Channel” to add something that interests you. In the new channel screen, you will need to choose a category, but you can also choose more than one. For example, if you want to play a channel focused on gaming and technology, you could check both of them, and have a channel with websites dedicated to both topics. If you come across a particular article that interests you, you can quickly click the star to add it to your favorites. From any screen in the app you can always click the star on the top right of the screen to view your favorites. You can also tap the gear to get access to settings. From here, you can tweak your channels, decide whether you share your favorites on Facebook and submit feedback about the app directly to the developers. If you are looking for an exciting new way to find out the latest news in the world, Snackr is a great choice. Instead of reading everything, you can have Alfred read everything for you. He is a friendly robot who is happy to let you know what is going on in the categories that interest you. It is a free application on the iTunes App Store, and it is most definitely worth checking out. What did you think of Snackr? Did you enjoy having your RSS feeds read to you? Let us know in the comments!